Signify that vehicle traffic stops here with this conservative style concrete bollard. The chamfered top with the single ring reveal strikes a refined detailed look for a wide variety of architectural fits. 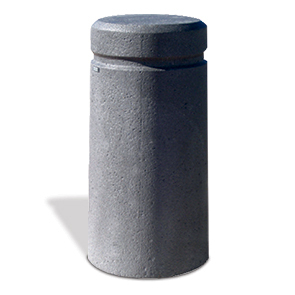 Dually reinforced, this concrete bollard construction features 1/4" and 3/8" steel rebar for heavy duty strength, durability and performance. This ASTM compliant bollard is available in select standard and premium finishes that are ready to fit in anywhere. Top 14"Dia. x Bottom 16"Dia.